The Ghana Highway Authority (GHA) raked in GH¢1.8 million in revenue last year from 36 toll booths constructed on some highways across the country. In 2017, GHA recorded GH¢1.79 million, representing a 4.3 per cent increase. The Roads and Highways Minister, Kwesi Amoako-Atta, revealed this when he officially commissioned four new toll booths with Point of Sale (POS) devices at Badukrom in the Shama District of the Western Region yesterday. POS devices are electronic gadgets used to process payments at retail locations by recording transactions and printing receipts. The toll booth was originally located at Beposo on the Takoradi-Accra main road and close to the bridge over River Pra in the area. The dilapidated structure was located within the Beposo town, which caused frequent accidents in the area. To this end, there was the need for GHA to relocate the toll booth to a convenient and spacious place. He said that the POS devices would ensure tracking of tickets sold at any period by toll booth attendants. Mr. Amoako-Atta explained that the machine had been introduced to assist GHA and the Ghana Road Fund Secretariat (GRFS) to curb revenue loss since it would minimize under-declaration of sales. The new facility also has automatic vehicle counting devices to make sure that all vehicles that pay the toll on a daily basis are recorded. 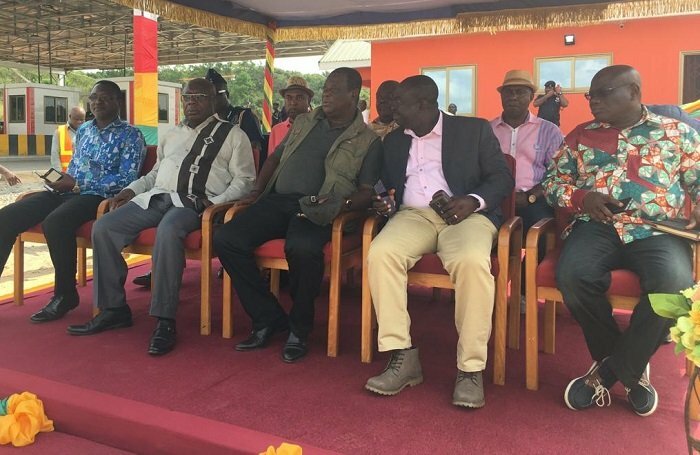 The minister indicated that the GH¢2.2 million facility, dubbed 'Badukrom Plaza' was constructed by the Bridge and Maintenance Unit of the Ghana Highway Authority. Mr. Amoako Atta indicated that the new facility has a beautiful canopy with four toll booths, paved road approach, three room offices with washrooms, closed-circuit television (CCTV) cameras and solar power. He mentioned that there was an elaborate programme to improve all 36 toll booths in the country. He also revealed that very soon, all toll booths would come under different management which would be expected to renovate them in the country. The minister charged all motorists not to discard tickets issued to them at the toll booths since there would be random check of tickets on the road by personnel of the GHA. He was hopeful this year's revenue target of GH¢1.9 million from the toll booths would be met to assist in the construction and rehabilitation of roads.